Feature:*Our Grinder is manufactured with Diamond Bit Grinder, which is highly durable with great hardness, perfect choice to make the grinder. *Universal USB charging port, more convenient to carry and use. 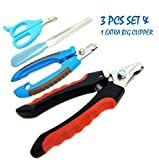 *Three size ports for different size pet's nails. Small and medium pets are suitable for small and medium-sized openings. *Ultra-quiet motor with high quality brass shaft- low noise, low *vibration. Let your pet have a great grooming experience. *With the pet nail grinder, there is no scratch of the floor and sofa due to long nail and no scratch of your skin any more. 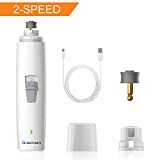 No hurt of nail break, no bacterial growth, care your pet nails.USAGE:1.First use, dogs and owners all need time to adapt it ,should give your pet a short time to adapt this grinder, let your pet smell and listen to the sound to avoid fear. and usually touch the dog's claws and build trust between you and your dog.2.For long nails, use the clipper to cut the long nail and the grinder to trim the nail, smooth the edges.3.Choose the suitable port for your pet. For large-sized pet and grinding fast, you can take out the cover, use the grinder side.4.Holding nail grinder with one of your hands, switch on the nail grinder. Holding the pet pads with the other hand, put pet's nail gently into a hole, and then begin to grind the pet nail.5.Just remember do not force your dog to be trimmed to prevent pet are too scared to scratch you, and never want to be trimmed.Note:*If it is the first time for the pet to use Electric Nail Trimmer Clipper, it is recommended that the sharp fingernail or long wear parts should be grinded firstly, but not too much, avoid causing bleeding. *For your pet's safety, it should not be more than 5 seconds for one lasting time, and be aware to adjust the grooming angle to polish pet nails. Our Safari Cat Nail Trimmer features stainless steel for a long-lasting, sharp cutting edge and a comfortable grip. Holding the paw firmly, trim tip of nail with a single stroke. Be careful to stop short of the quick, the blood vessel inside the nail. * PawGroomers Illuminated Pet Nail Clipper is the best nail clipper to safely and efficiently clip your pet's nails. * 5x Magnifying Glass let you see the bloodline (quick) to help you trim at the right spot every time like a professional. 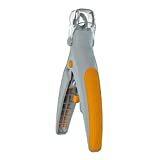 * PawGroomers Illuminated Pet Nail Clipper helps you make the nail trimming safe. * PawGroomers Illuminated Pet Nail Clipper reduces the scratch marks on you, furniture, doors, and wall. 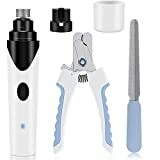 PAW PERFECT by Bell and Howell We decided to take the conventional rotating nail trimmer made it more powerful, but also, safer! Specs: * 7.30 inches long is just about the perfect size for anyone to use * Very solid and compact construction. This is quality design, because we know you and your pet deserve just the best! * 7,000 RPM (Low mode) to 14,000 RPM (High mode) of filing power trims away even the toughest of nails in minutes! * Effectiveness, design, safety, in one product, something only an all-American brand such as Bell and Howell can provide. Customer Service Details We here at Bell and Howell are never truly satisfied unless you are. If you encounter, or suspect issues with your purchased product please send us an email and we will be more than happy to fix everything for you. 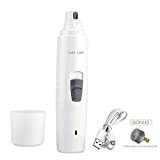 Loki Loki Electric Pet Nail Grinder has the outstanding high performance with an upgraded powerful motor and 2 durable diamond grinding bits. 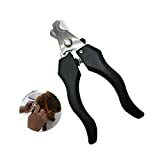 3 different ports meet most range of dogs & cats' nails trimming work, super low noise & low vibiration for more friendly using experience. Super low noise performance can reduce your pets' anxiety and upset while trimming. It's a handy cordless nail grinder with antiskid design. Rechargeable for max. 6 hours operating time.